38th ANNUAL CONVENTION, SEMINAR AND EXHIBITION ON EXPLORATION GEOPHYSICS 20 - 22 October, 2016, Hyderabad, India. AEG started publication of the JAEG in 1980. The JAEG is a quarterly Journal and is currently in its XXXVI volume. 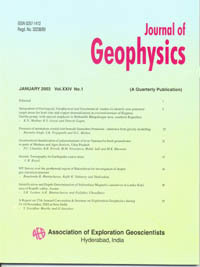 The Journal attracts scientific papers from a large number of earth science institutions in India and abroad. Since inception of the Association more than 3000 papers were presented in the Annual seminars of the association. In addition, research papers were also received directly for publication in the journal. After rigorous reviewing process by experts in India and abroad, so far 760 papers have been published between July, 1980 and January 2015. Over 1000 copies of each issue of the Journal are circulated to AEG members and subscribers in India and abroad. Hyderabad - 500 017, Telangana State, India.